what you WILL be capable of very soon. At my age, I get to pat myself on the back for how far I've come, for what I've accomplished. I'm a successful man. I have a wonderful life, a job that is rewarding emotionally and financially, a wonderful family, great friends, good health. I've "arrived" ... right? Recently, a very gifted man reached out, "took me by the collar," looked me in the eye, and then proceeded to seriously reprimand me! He reminded me that I am falling far short of making the most of my natural-born talents. Even at my age. Especially at my age! His harsh words weren’t from anger or frustration. They were the words of sensibility, meant to remind me of who I really am, of what I am still capable of, and of how far short of the "accomplishment" mark I still am in my life. Now that he has helped me realize it, I find it almost comical just how easy it was to be lulled into a false sense of inflated accomplishment when there is just so much more that I can do . . . that I should do. Who was this man? It was Steven Pressfield, a world-renowned author of many best-selling historical fiction novels. One of his books was turned into a movie, The Legend of Bagger Vance. Starring Matt Damen and Will Smith, directed by Robert Redford, it was a thought provoking movie with a powerful life lesson anyone could use. My "reprimand" came in the form of a remarkable audio program, The War of Art, written by the talented Mr. Pressfield about the creative process. It's a process that applies to far more than writing or painting. I'm neither. I have to say, his words woke me up. And I really needed to hear them. Do you need those harsh words, too? Like me, I'm willing to bet that by listening to the bestselling program The War of Art, you’ll wake up to a life that exceeds your expectations. Have you ever brought home a treadmill and after a short run at it let it gather dust? Ever committed to a diet or a course in yoga . . . only to quit soon afterward? Are you a writer who doesn't have time to write, a painter who doesn't have time to paint, an entrepreneur who never finishes a venture? Then you know what resistance is. If you've been worn down by resistance, you are not alone; many good men and women have bitten the dust over it. And recognize it or not, resistance has planted itself firmly in your life and is jumping up to slow you down every chance it gets. The The War of Art will give you the ability to break through blocks and win your inner creative battles. If you’ve ever dreamed about breaking new ground in your business, writing the great American novel or regret not finishing a painting, poem, or screenplay; starting a business or charity . . . even running a marathon, it will inspire you to identify, defeat, and overcome the obstacles that are standing in your way. Do you think that's an unrealistic claim? It's not. Listen and find out for yourself. Steven Pressfield warns us that resistance is our biggest enemy, so . . .
Don't RESIST! Order the WAR OF ART now. You will be glad you did. YES, I want to elevate my creative abilities to make the most of everything I do. 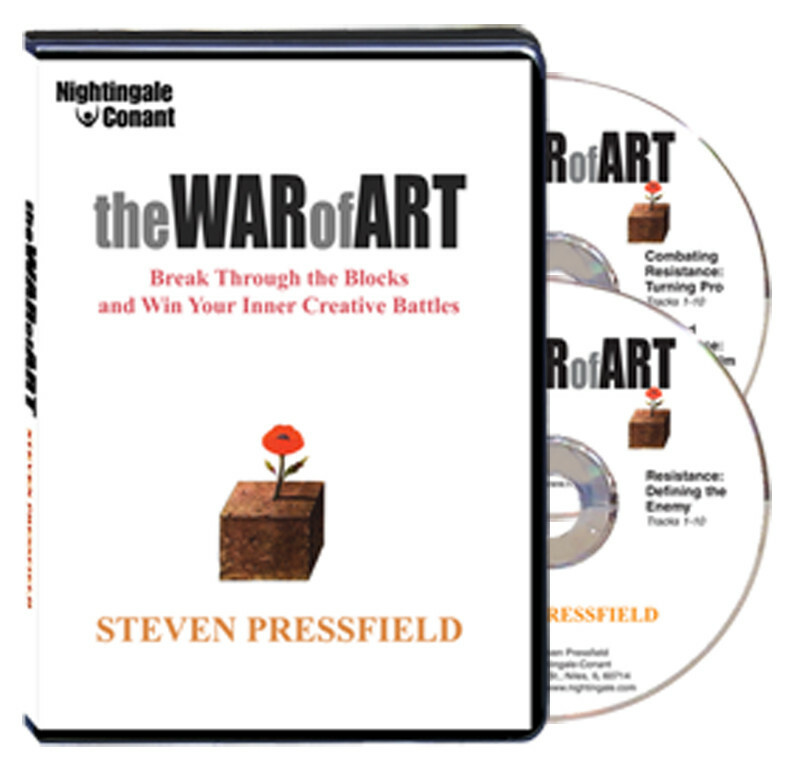 Please send me Steven Pressfield's 2-CD audio program The War of Art for just $29.95, which is 70% OFF the regular program price of $99.95! Take advantage of this limited-time special discount now! If it doesn’t exceed my expectation, I can simply return the program in the next 30 days for a full refund. No questions asked.